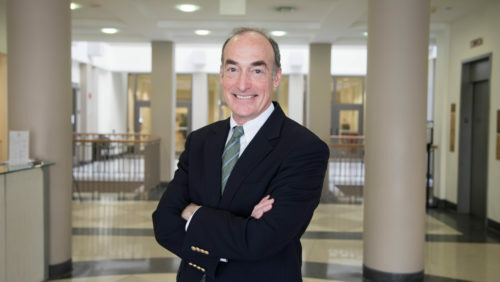 Professor William W. Buzbee, shown here at Georgetown Law, takes to the road in February for a Duke Law Administrative Law symposium called “Deregulatory Games” — an idea he proposed. Professor William W. Buzbee takes to the road in February as a speaker at a Duke Law Journal Administrative Law Symposium called “Deregulatory Games” — an idea he proposed. His paper, “Statutory Abnegation in the Deregulatory Playbook,” will be presented at the symposium and published in the journal. Other recent articles include “The Tethered President: Consistency and Contingency in Administrative Law” in the Boston University Law Review (also selected as part of a competitive call for papers as part of the Association of American Law Schools conference in January); and “Deregulatory Splintering,” a paper presented in November 2018 in Chicago and to be published as part of a Chicago-Kent Law Review symposium issue. Buzbee, who came to Georgetown Law full time from Emory Law in 2014, specializes in environmental law, legislation and regulation, and administrative law. We sat down with him to glean his thoughts on deregulation, statutory abnegation, teaching and more. The Duke Law Journal is having a symposium on February 8 with the theme of “Deregulatory Games” — which was your idea. What prompted you to submit a proposal on this topic? Right now, we are seeing in the Trump Administration the most concerted deregulatory push perhaps ever — certainly the most concerted, one-sided deregulatory push since the Reagan Administration. I and most of the other top administrative law scholars in the country have been studying it, trying to figure out what they are doing, what’s the logic behind it, is it legal, what the effects will be. So my thought was, there are a lot of different strategies that are being played with around deregulation. And so I proposed to…get the nation’s top administrative law scholars discussing what I call “deregulatory games” — the strategies used both for and against deregulatory rollbacks, what many people call regulatory rollbacks. I contacted a number of the top administrative law scholars in the country, and they all said yes. You are presenting your paper, “Statutory Abnegation in the Deregulatory Playbook.” What is it about? Agencies are now claiming they lack power to regulate? There has long been this theory that agencies will try to grab power and expand on power. It’s almost a core belief of people who oppose regulation. What’s curious here is that during the Trump Administration, a whole slew of agencies have done the opposite, saying that “we can’t regulate as we’ve done before, because upon reconsideration, we never had the power we previously claimed.” They are generally making the claim that they really have either no power at all in an area or that they had no power to regulate as they did. So my paper is trying to figure out, why would agencies do that? How are they doing with this, why are they doing it and how do you explain it? Looking at how they’ve done it, there’s a good argument that this is really about politics, that agencies are trying to gain very quick political credit for deregulating, with little concern about whether it will be upheld in the end. Because most of these claims, when you look closely, are quite farfetched. So far only a small number of such actions have been reviewed in the courts, but so far no agency has succeeded with these new claims of no power. An agency cannot seek to make a policy change yet ignore the effects of its actions; they need to explain what they did in the past, identify the policy change, look at the facts, look at the science, and then justify their choice. For example, when the Trump Administration sought to reverse a policy of enforcement forbearance by the Obama Administration for the category of “Dreamers” — immigrants without legal status but here in the U.S. since childhood with clean law enforcement records — the Department of Homeland Security and the Attorney General claimed they had no legal power to offer this enforcement break to immigrants. When the courts have looked at the relevant law, however, they’ve said this new legal claim of no power was in error. There might be room to adjust the agency’s policies, but it could not do so based on a legal mistake and had to provide the good reasons and factual engagement required by law. Some argue that deregulation helps economic growth and innovation. But at the “War on Regulation” conference here last June, you pointed out that regulation plays critical roles, that the government needs to protect all of us, and that statutes rule. What are your thoughts? First and most importantly, Congress has passed lots of laws that require protective action — whether that’s from market frauds, pollution, unsafe products, pesticides, to make sure we have safe drinking water, or safe food. When agencies reflexively reject regulation, they are often eliminating protections, and those lost protections can cost billions of dollars, cost lives. You cannot look only at the side of businesses, and not think about people who would be protected. The relevant law here about what agencies can do when deregulating — the most important opinions were by the late Justice Antonin Scalia (C’86) and retired Justice Anthony Kennedy. They said, when agencies change policies, they have to look at the underlying facts and the underlying science and in a comparative way address the costs of the change and discuss any changes in legal reasoning… The Supreme Court, speaking through some of its most conservative justices, has said, there are rules here — agencies have to fully engage with the science, the facts and the law. President Trump’s Executive Order 13771 basically could never be followed by an agency without violating the law, without ignoring what statutes require, because statutes are always about protecting people. Laws exist to provide benefits, to provide protections. That Executive Order says, look only at costs and eliminate two regulations for each new one. It nowhere talks about the benefits of regulation, and the benefits of regulation are basically why these laws exist at all. The expertise here is amazing. I, Professor Lisa Heinzerling, Professor David Vladeck (LL.M.’77) and many others — are frequently asked to speak locally and elsewhere around the country and share our views on how regulation works and is not working. Professor Heinzerling and I have given several different talks at the D.C. Bar about regulatory changes. I’ve testified in congressional hearings and also given briefings on the Hill to legislative staff, trying to help them understand these deregulatory shifts. At Georgetown, you have a concentration of the nation’s most important regulatory scholars in administrative law, legislation, privacy law, intellectual property, environmental law and more. And so it’s a wonderful feature that we learn from each other and we can go out and speak at other conferences, drawing on what we’ve learned. We can share [this knowledge] with the agencies, courts, Congress, and also the states. In D.C., talk about effective regulation and battles over the administrative state are a near constant. During the previous administration, there were issues about crafting effective and legal regulations and I was involved in discussions about how to make sure there were no constitutional issues. Assistant Dean Vicki Arroyo (L’94) and the Georgetown Climate Center have had a huge influence on how the federal government and how the states have worked to try to begin to deal with climate change. When I sit down and share ideas and developments with Professor David Vladeck, Professor from Practice and Supreme Court expert Irv Gornstein, legislative scholar Professor Victoria Nourse, environmental expert Professor Hope Babcock, comparative constitutional law experts like Professor Yvonne Tew or tax experts like Professor Lily Faulhaber, I learn from a wonderful group of collegial colleagues, wonderful teachers and deeply knowledgeable experts. You are teaching two classes this semester — Legislation and Regulation, and the Art of Regulatory War Seminar. How are these classes relevant to today’s political landscape? Every single word I teach is relevant every day! But truthfully — I focus on giving students the skills to be effective working in the world of statutes and regulations, and that’s most law. Sometimes the law is settled and sometimes everything is up for grabs. Right now, you have a remade Supreme Court, where it is rethinking its doctrines, you have Congress engaged in hyperpartisan warfare, and so what the legislature will do isn’t clear. A lot of the game ends up shifting to agencies that have to deal with societal needs and problems. What it means is that the law is constantly being fought over in every venue. Our students will be coming of age as the law is being remade and tested. The previous deregulatory push was when I was in law school. Certainly this very concerted effort to roll so many protections back is a new thing… All presidents remake regulations some. All presidents have different goals, and interest groups that they try to satisfy. What’s notable here is President Trump’s actions have been almost completely in a deregulatory direction. They’ve just been rolling back regulations. Being in Washington, [our] students and professors are constantly coming into contact with lawyers, lobbyists, legislators, staffers and various associations…some of these industry groups have told me that they feel like they have to applaud deregulation. But sometimes these deregulatory efforts don’t make sense and are actually disrupting their business plans … Most businesses do not like regulatory instability. What would you say to students to get them to take administrative law? It’s where politics meets law. It’s where the rubber meets the road, some people say. To be fluent in the moves and countermoves of legislation, regulation and administrative law is essential to being a good lawyer. And that’s true for business lawyers. If you do mergers and acquisitions — heavily regulatory. If you do intellectual property — heavily regulatory. If you do tax — it’s all regulatory. In every realm, you need to really understand how the law works.